James Cameron is undoubtedly responsible for the 3D fad in movies and television, and the Titanic 100th anniversary will come complete with what is sure to be the biggest 3D movie experience since, well, James Cameron’s Avatar. Since the emergence of Avatar, big and small name directors alike have switched to this format. Spielberg, Jackson, 3D piranha movies, it seems like the 3D film is something that is not going away anytime soon, at least not until James Cameron does. The release of the 1997 instant classic Titanic is sure to have audiences gasping, crying, and ducking debris large hats throughout the entire film. A trailer of the new Titanic blockbuster is available online, and though they are generally presented in 2D, it is possible to see where Cameron intends to go with the film. Like or hat e the movie, it is certain that Titanic 3D will not be an after the fact we just made this into a 3D film to boost ratings production. The king of 3D himself will be giving it his all and giving audiences one of the largest grossing films ever a beautiful three dimensional revamp. The film is set to be released on April 6, 2012 just four days before the Titanic embarked on her maiden voyage 100 years ago. Titanic 3D will be released nationwide and on IMAX and in addition to the 3D version, a 2D version will also be released on a different print that Cameron says will make the film look even more beautiful. $18 million was spent on converting the film, which one can imagine is beans compared to what the film will gross on the first day of release alone. Prepare to see what is likely to be the highest grossing film in history. Again. 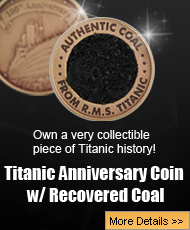 Next post: Was the Titanic sinking the result of bad marketing?